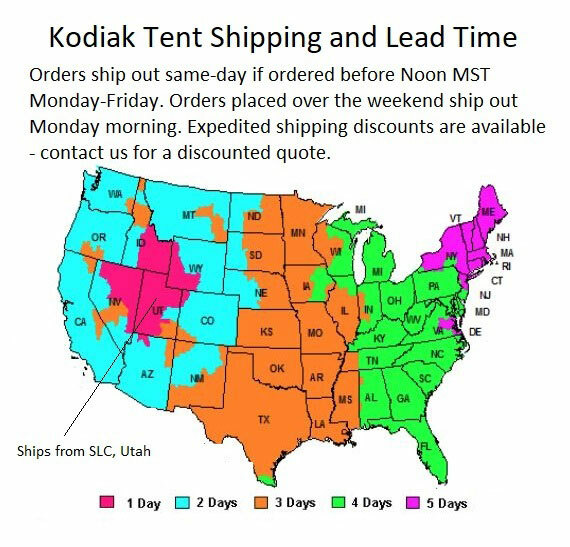 If you have always wanted a Kodiak Canvas truck tent for your tent, but could never get one that fit, then this is your lucky day! 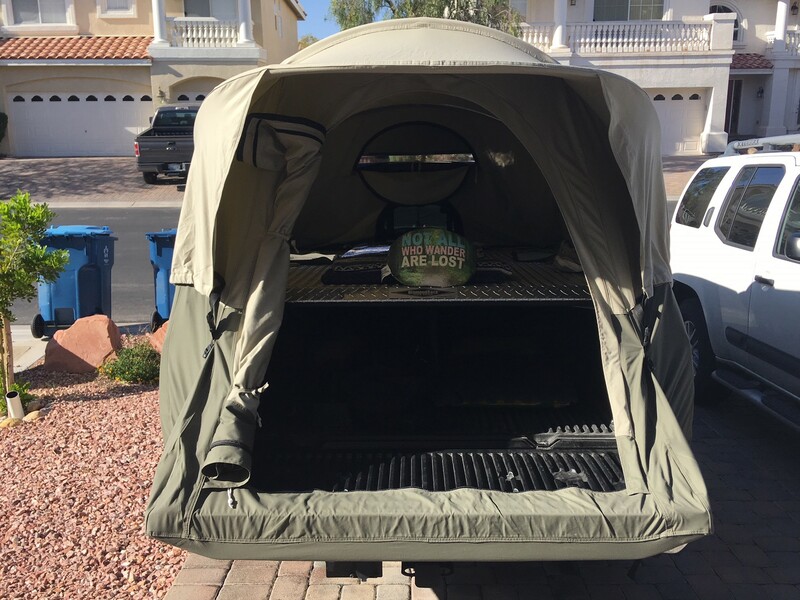 This Brand new Kodiak Canvas Truck tent will now fit mid sized trucks like the Toyota Tacoma(may need special clamps)and the Nissan Frontier and many others. 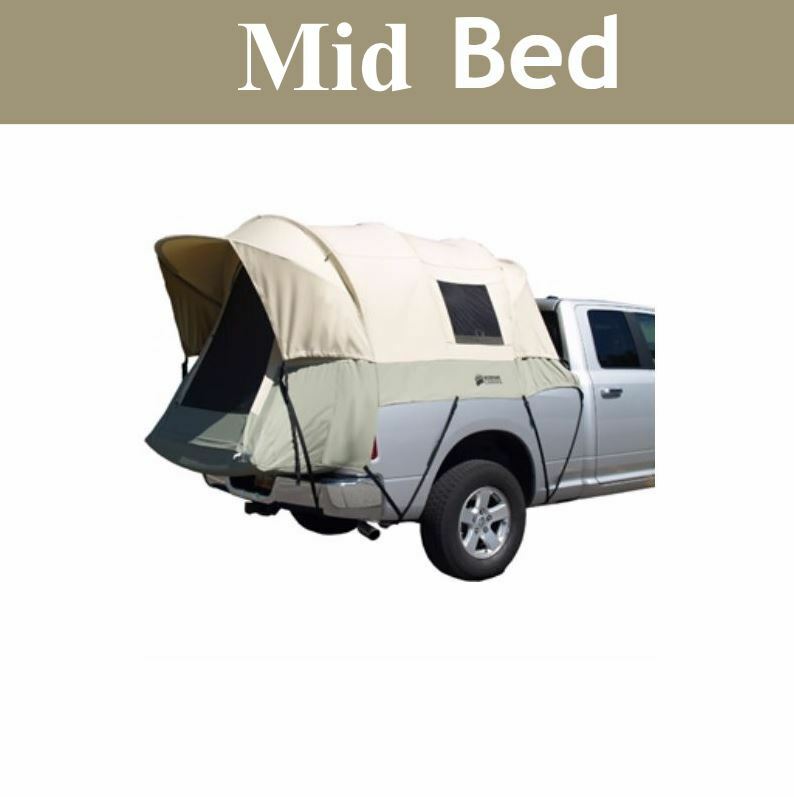 Get this brand new high quality Kodiak Canvas tent for your pickup truck. 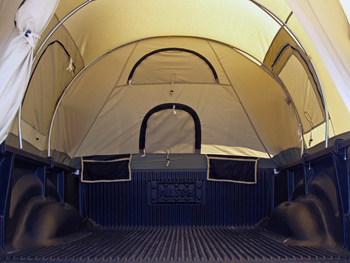 This tent allows you to pitch your tent anywhere your truck goes. Stay off the ground, high and dry, and away from the critters. Made with the same Hydra-Shield 100% cotton duck canvas that is durable, watertight, and breathable as our other Kodiak Canvas tents. Features five screen windows with no-see-um mesh, for ventilation, light, and openness. Includes a cab access window. This unique, clamp-on rail design with its integrated, 3/4 inch, steel tube frame provides unmatched sturdiness and allows for easy set up and take down. It is rated for all-season use, it will keep you warm n the winter and cool in the summer. You can run a power cord from your cab to power your appliances, so you can still have the basic necessities in even the most rural areas. This tent features top of the line YKK zippers. The tent sets up with the tailgate down for added space. Includes convenient gear pockets well as the carry bag. 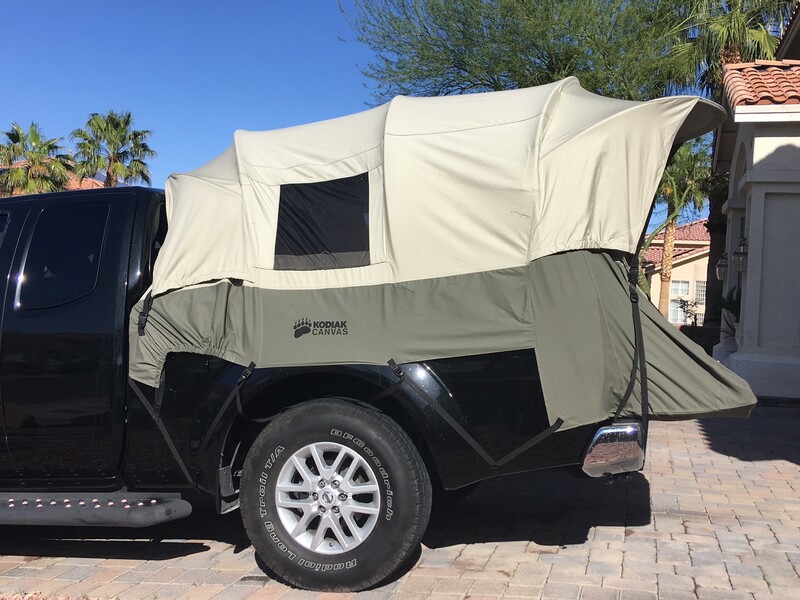 Finally we have a truck tent that will fit the needs of Toyota Tacoma,(may need special clamps)Ford Ranger, GMC Canyon, Chevy Colorado, and Nissan Frontier Customers! Hydra-Shield, 100% Cotton Duck Canvas. Durable, watertight and breathable. Tunnel shaped design maximizes interior space. Tall 5 ft. ceiling height. 5 windows provide excellent ventilation and openness. Sturdy, 3/4 inch, steel tube frame. Large D-shaped door with top of the line YKK zippers. Covered entry to ensure an easy exit. The only condition I had for this tent is that it work with my existing Diamondback tonneau cover on. And it does! I have a heavy duty tonneau cover that I can sleep on top of, and I have no desire to take it on and off when I camp. What I love about the Kodiak is I can have it set up and still I store gear underneath me. I can sit up just fine without touching my head on the top of the tent. I have two adjustments to make, one is minor: While the door is closed, reaching the door zippers is a little inconvenient whether I'm seated on or laying on the tonneau cover. There are actually two zips: one that goes only horizontal across the bottom of the door, and one that arcs over the rest of the door. In a closed position, the arc zipper ends at the bottom of the door. It would be nice if it had a dual zipper that can be used from the top or the bottom, but it's only got one. To make both zips easier to reach, I plan on putting a longer zipper pull (maybe about 12-18 inches of paracord) on both and using a magnet to stick those pulls at a convenient height, like mid-door. The other problem is that the pins where the tent poles rest are attached to a 4 foot flat metal rail. That rail has to go *under* the edges of my tonneau. For now, I have to loosen the tonneau clamps, lift it slightly, and slide the flat rail under the cover. VERY inconvenient. For this, I plan to make three smaller pin mounts (instead of one long footer) so that I can just open my tonneau and insert them, instead of loosening and lifting it. Alternately, I could permanently mount some sort of pin-mount to the tonneau cover, but I'd rather not modify my cover if I don't have to. I'd say it's probably a easier to set up if I didn't have a tonneau cover, but it can certainly be done with the tonneau on. I've done it twice now and I'm sure it'll get easier with practice. It's a great tent and I'm excited to use it! 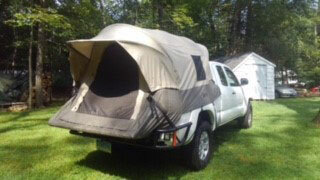 I bought this truck tent for my 2013 Toyota Tacoma 5' truck bed. Even though the specifications state the truck tent will fit 5' to 6' beds, it really doesn't. It's seems to be made for 6' beds as the tent around the tailgate is nowhere near tight and it slopes downward. Kodiak instructions annotated that it may take some adjustment to be fitted properly, but after many hours of adjustment, it just doesn't fit. 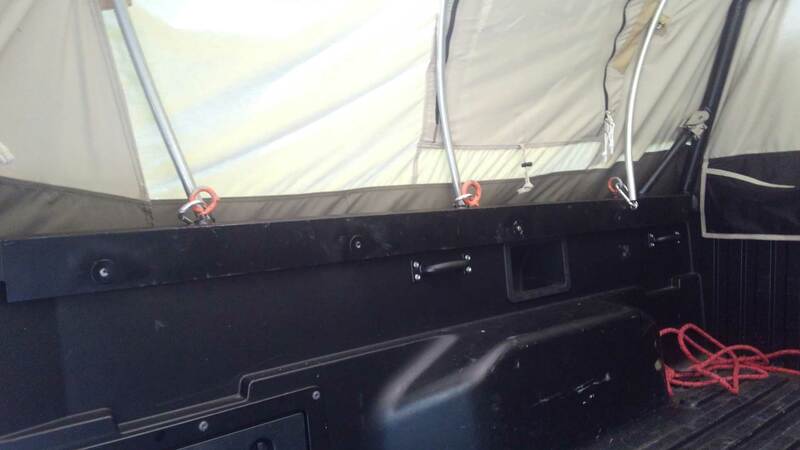 Also, because Toyota trucks have a “rail system,” I had to buy camper top clamps in order to properly secure the metal side rails to the truck bed (which added an additional $50 to the cost of this tent system). Competitive Edge (Seller) Response: We are sorry that that wasn't able to work out for you, we have discovered that Although it is the closest truck tent to fitting the Tacoma, it may require custom clamps to fit properly. Thank you for your feedback, and we have updated our listing accordingly. This truck tent will not fit the Tacoma double-cab truck with a 5 ft bed. 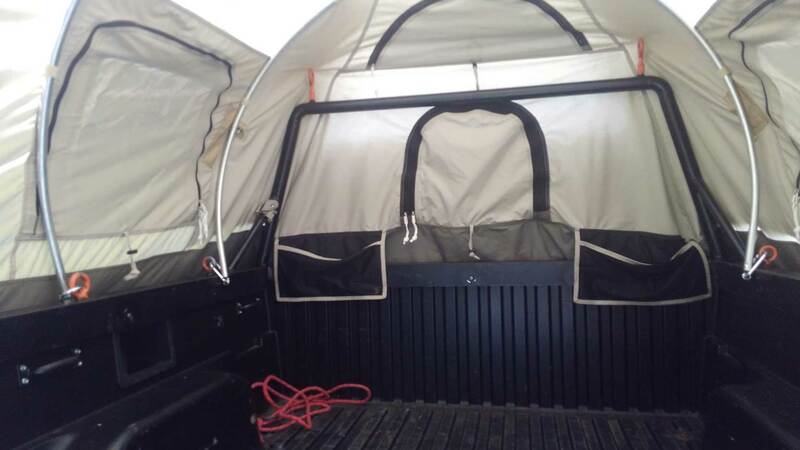 The tent is too long, and the hardware store styled C-clamps which come with the tent do not work with the Tacoma bed U-channel track mounting system. 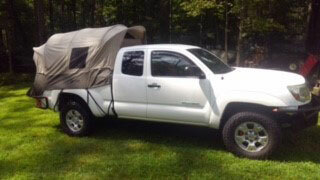 Q: I have a 2015 Tacoma short bed 5" will the mid size 5.5' - 6' tent even fit a 5' truck bed? A: Yes, model number 7211 will work with your truck. Feel free to contact us with any other questions. Q: Will this fit a Toyota Tacoma small truck? A: Yes, this is the only one that will fit a Toyota Tacoma; however you will need special clips to attach it. (Most trucks don't need these) To get those clips please call 801-508-2880. Q: Will the med size fit a Chevy Colorado? A: The 7211 will fit a Chevy Colorado. A: These include a Lifetime warranty. See the reviews at how well they hold up. These are amazing. Dimensions: 10" x 47" x 10"